Decks vs Patios: Which is Right for You? - Eby Exteriors, Inc.
Home » Outdoor Living » Decks vs Patios: Which is Right for You? If your PA home lacks outdoor space, a deck or patio can provide you with the extra square footage you need to relax in the sun, hang out with friends and family, and fire up the grill for outdoor barbecues. Both will allow you to maximize your outdoor living, but depending on your space, needs, and budget, one option may be better than the other. Before choosing between the two, you’ll want to learn more about each one, consider all of the factors, and examine the pros and cons. By doing so, your toughest decision will be what grill to buy, where to place it, and which friends and family to invite over to celebrate the big reveal. Custom Patios vs. Decks – What’s the Difference? Decks and patios may seem similar, but there are important differences between them. Decks are typically built of wood, vinyl, or composite materials. Although deck builders can construct them close to the ground, they don’t sit directly on it and feature support systems to hold them up. As such, decks can be built on the first or second floor of a home. Some can even be built on roofs for an even better view of the surroundings. Patios, on the other hand, are placed directly on the ground, and they can either be connected directly to a home or installed in a separate area of the yard. Patios are also constructed of concrete, brick, stone, or pavers made out of other non-organic materials for long-lasting maintenance-free use. Due to this, patio additions can feature fire pits, outdoor kitchens, and other features to bring the indoors out. Composite decks made with the best decking material provide an average return on investment of 87 percent, which is higher than any other home renovation. Since deck builders can construct decks high off the ground, they offer the opportunity to enjoy better views. 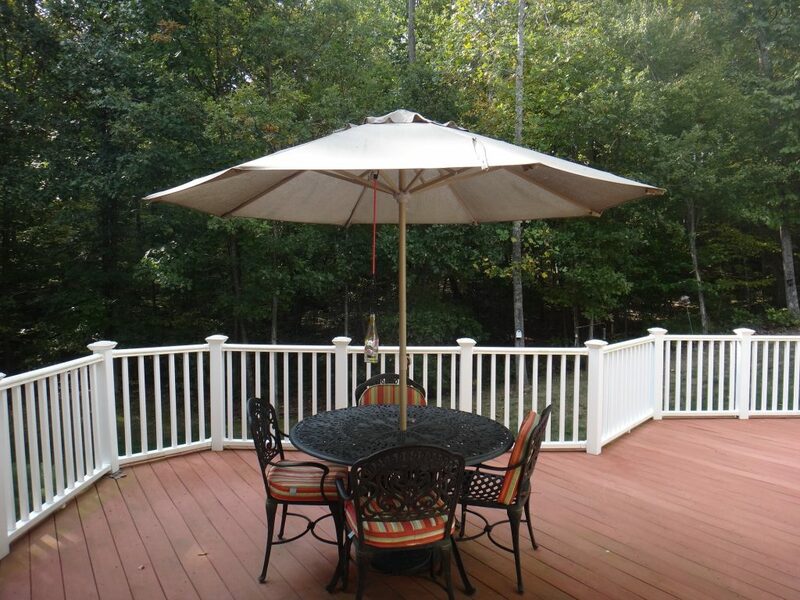 Unlike patio additions, wood and composite decks can be built on sloped and uneven land. Wooden decks can be stained or painted any color, allowing you to add a pop of personality or match the color of your home. Decks, especially those made out of wood, naturally absorb less heat. This makes them more comfortable during the hot summer months. Wooden decks must be stained or painted and sealed every two to three years. Even when regularly maintained, wooden decks are susceptible to the elements and have shorter lifespans than patios. Since they’re elevated off of the ground, decks have weight restrictions and aren’t always ideal for outdoor kitchens, hot tubs, and other large, heavy installations. A well-built stone, brick, or concrete patio can last upwards of 25 years or more. Since stone, brick, and concrete is extremely durable, patios are virtually maintenance-free. Since patios are lower to the ground, there is more flexibility in the design and landscaping to add more privacy. Unlike decks, patios are best-suited for flat, level terrain. Although a level foundation can be created by pouring extra concrete, this raises the cost. If you live in an area with extreme weather or if the soil underneath your concrete patio isn’t prepared properly, it can become prone to cracks. Patios are also susceptible to stains, which can be difficult to remove. Ice forms easily on stone and concrete surfaces, increasing the risk of slipping and falling.